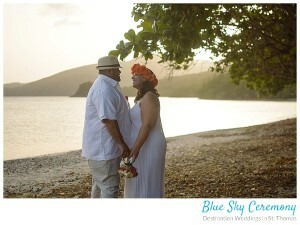 Brewers Beach in St. Thomas is a local favorite for weddings. The reasons are simple. The water is beautiful, the beach is big and there is no site fee! Located on the South Side of St. Thomas west of the airport, Brewers has hosted plenty of beautiful weddings in its day. The beach is one of the larger beaches on the island so there are plenty of spots to say your wedding vows. The beach sits in a small bay, making for usually calm waters. Views are of the Puerto Rican islands of Culebra and Vieques and the relatively undeveloped and wild West End of St. Thomas. In the distance is the airport landing strip where you can watch the jets land on the island. It is far enough away that its not overly noisy. 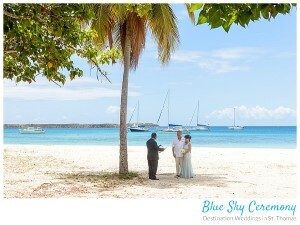 Brewers Beach is best suited for smaller destination weddings. Amenities are somewhat limited. There are bathrooms for changing into and out of your wedding dress. There is a food truck parked just off the beach where local foods are served and beverages are available. This is not fine dining by any means, but island-fare is delicious and saves you the trouble of packing food for your guests if you are going to be at the beach for a few hours. Plenty of palm trees and sea grape trees inhabit the beach. Photos turn out beautiful on the beach and sunsets are stunning. A unique photo opportunity exists a few feet from the beach. 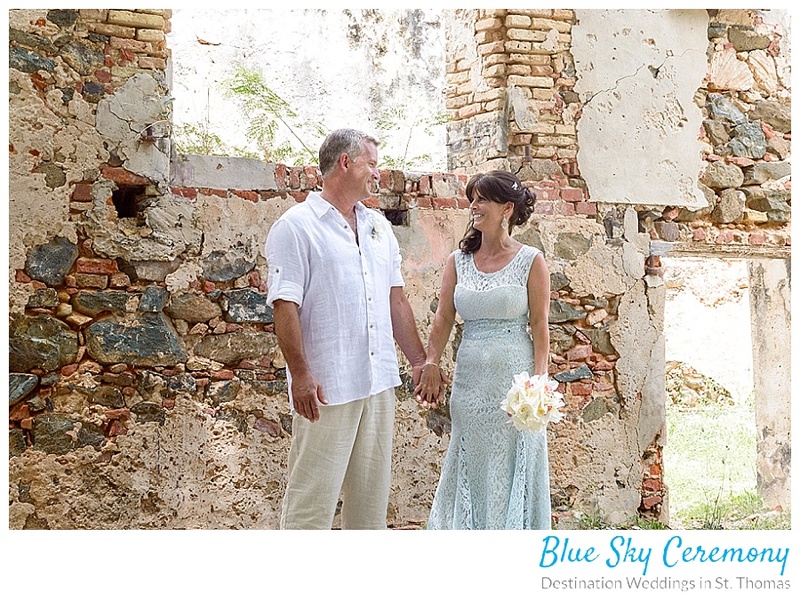 Old ruins from a bygone era of St. Thomas’ history provide one of a kind wedding photos. Brewers Beach is easy to get to and parking is plentiful. The best time of day for a beach wedding is the morning or evening. Weekends can get a little busy so it’s best to plan a wedding during the week. Across from the beach is a large field with some tree cover in front of Reichold Center for the Arts where you can pay a small event fee and have an outdoor reception under the stars. Many couples looking for a simple, budget friendly wedding choose Brewers Bay for their wedding venue.